So I wanted to treat myself to a new handbag, but the thought that I may end up in the poor house with these medical bills put the kabosh on that. My Mom, who in her inifinite wisdom knows that there are very few things that cheer me up when I am in a funk… gave me the CUTEST summer purse today. 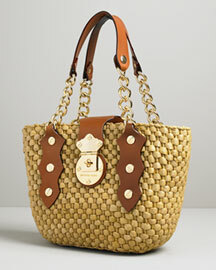 A Michael Kors Santorini Woven Shopper with white leather detail. I feel 2% more happy today. Hi, I know this might be a little off topic but it’s about shopping! I recently started a personal shopper company and wanted to know did you or someone you know in the Philadelphia area need a person like me to help you out when you don’t have the time to shop for clothes? ?